One of the most persistent refrains by new students who do not yet understand the power of what they are being taught is "Yes, But On The Street.. Such responses contrasting Mat Time with Real Time usually mean that the student doesn't yet understand the power of the circle and imagines that in a Real-life situation, it is only sensible to fall back on what has worked (or what he imagines to work best) — pure muscle power and linear energy. There is a reason why the circle is almost universally considered the symbol of God, of holiness, completeness, and power beyond our comprehension. Much of this is good rotational physics. And the best way to develop awareness and confidence in rotational physics is to demonstrate it with a Real World example. An excellent tool is laundry. Fill a laundry bag or plastic trash bag with old clothes, towels, to a weight of 20-30 pounds or more. Nage stands still at one side of mat and heave the bag as far as possible across the mat with one arm using linear energy and muscle power only. That is, no wind-up, no swinging. Uke mark the point where the bag falls. Turn a partial tenkan and release bag to fly across the mat. Observe the point where the bag falls. Repeat with a complete tenkan. Compare not only the distance, but the effort required to move the bag, and the power generated in the course of doing so. Two walls of our dojo are lined with plywood panels. Although I can only heave the heavy bag a few feet with a one-handed throw, two tenkans will send a heavy bag flying across the entire width of the mat to hit the wood panels on the opposite side with an impressive whack. Note also that you must extend focus and intent to hit a particular spot. It is often difficult for a new student to realize when he is backing up, when he has left his circle, when the energy has changed from rotational to linear. Practicing tenkan (and other techniques) in water encourages circular motion as linear motions are impeded by the resistance of the water. 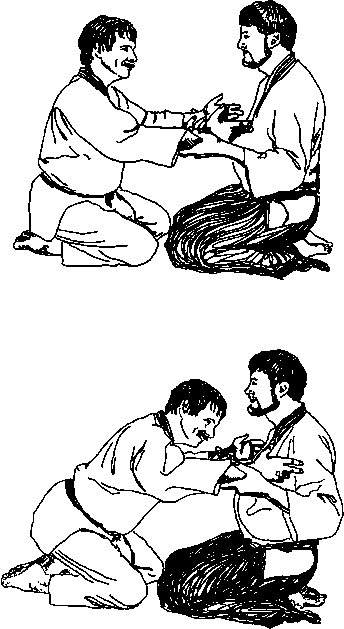 After turning tenkan around a staff or a balloon or a string, try turning a series of tenkan while holding a 10- to 20-pound weight in the turning hand. With a very heavy weight, you may not be able to do it at all, but if you do, you will not be able to do it wrong. Walk across the mat or the room, turning tenkan repeatedly in the course of the walking.